Outdoors for All is a community of volunteers, participants, staff and supporters. We want to bring these communities together by sharing experiences, thoughts and faces! Do you receive the Monthly E-news? Jackie works to keep the Outdoors for All community informed on programs, volunteer opportunities, amazing successes and other good news! 1. Where are you from and what brought you here? I’m originally from Kent, WA. Born and raised. 2. How did you hear about Outdoors for All? I was working at The Summit in Snoqualmie as a snowboard instructor at Summit West while studying at Central Washington University. I remember seeing the programs on hill in action and always thought it looked really fun and amazing. 3. What made you want to get involved with Outdoors for All? I was looking for a new experience in event planning. Outdoors for All was hiring a temporary event planner for the 2013 Spree at Alpental and it seemed like a perfect fit. That was five years ago! 4. What’s been your favorite experience with Outdoors for All so far? I really enjoy being able to revisit my roots as a snowboard instructor. Ever since I started snowboarding in 9th grade I became a complete snowboard geek. I even wrote a paper on the history of snowboarding for a junior high assignment. I love being able to spread the ripple effect of snowboarding in the Outdoors for All programs as both instructor and clinician. 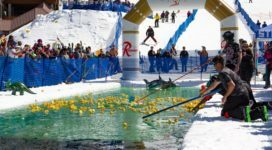 But most recently, I was able to go to The Hartford Ski Spectacular in Breckenridge for the first time! 5. Tell us more about that experience. I was prepared for it to be a big production. I was ready to be overwhelmed for the first time. Over 800 people came from all over to learn, teach and share ideas and experiences related to adaptive skiing. 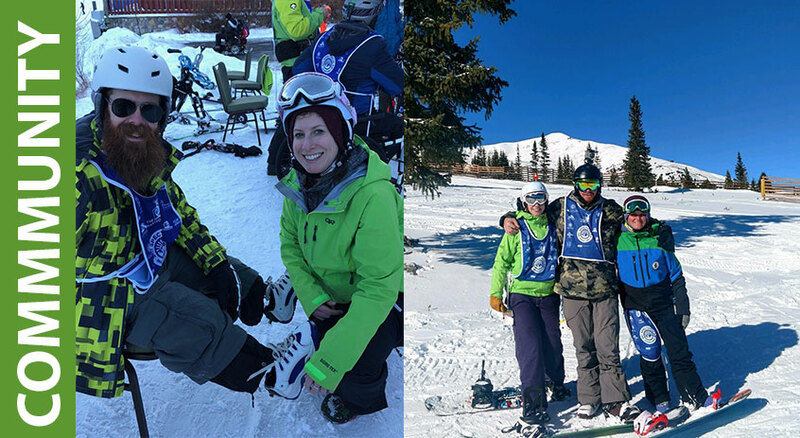 It was really amazing to be able to make connections with other instructors from adaptive programs around the country – including our own volunteers and staff – and to work with a couple of new students. One student was a below knee amputee military veteran and the other student was a triple amputee. They were fun to work with and both of them were able to reach their goals for the week, to snowboard with control and to snowboard independently. The experience of helping someone accomplish something they didn’t think possible for themselves has been the most rewarding thing I’ve been able to be a part of. And I get to see this all the time at Outdoors for All, either through directly hearing from those in our programs or from staff who work with others. I feel pride helping people, but that’s nothing to how I feel about being able to help someone feel pride in themselves. I’m was still receiving pictures and seeing Facebook posts from those Ski Spectacular students about their experience! If you know someone who should be featured in our Community Connections, contact JackieM@outdoorsforall.org.